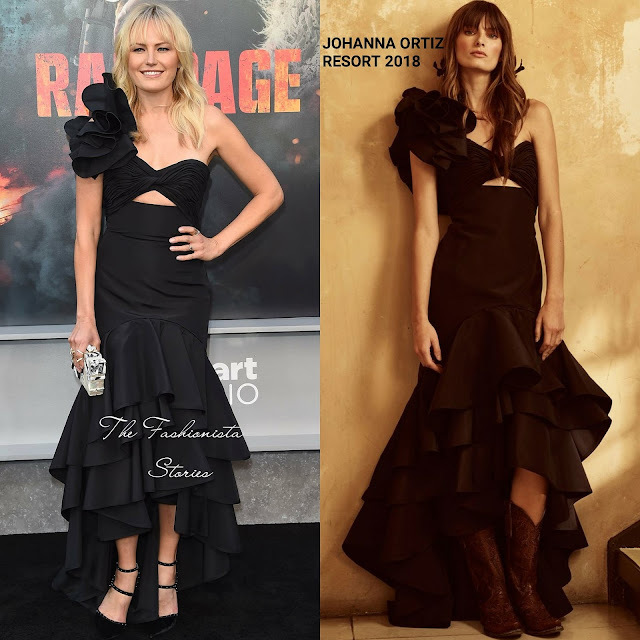 Malin Akerman was on hand for the premiere of 'Rampage' yesterday evening(April 4th) at The Microsoft Theater in LA. Rocking an all black look, she wore a JOHANNA ORTIZ RESORT 2018 ruffle one-shoulder dress with a cutout waist, a tier skirt and a high-low hem detail. Malin's dress is a signature look by the designers which celebs seems to love. While do like the dress, I wish her hair was off-the-shoulder and a simple embellished black sandal would have been ideal here. She finished up with minimal make-up and the EMM KUO 'Guggenheim' clutch. What do you think of the styling of Malin's look?